These are made from almond nut containers (lables peeled off, washed and dried). I really liked them because they are metal, but have no sharp edges. I then cut my scrapbook paper 2"X11" and inked the edges. Then using double sided tape I taped it onto the container. The lids I mod podged on scrapbook paper. Then glued on twine. 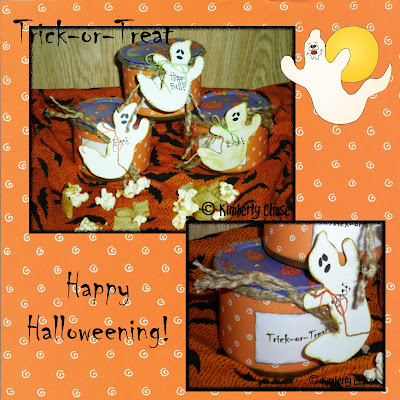 The "Trick-or-Treat" tags I printed off on the computer, cut out, inked edges and glued on. I then just drew a ghost, cut out, inked edges & tied onto twine. I filled the containers with some really yummy popcorn mix. Happy Halloweening! These are adorable! Perfect for coworkers and such. Cute job, I love them.